As a part of Community Love Week, Game Team One will be playing some of the latest community created games and weighing in on them. We really love seeing how creative all you designers out there can be with the GameSalad toolset! 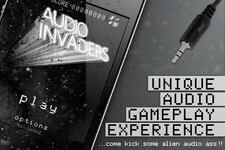 Today, Billy Garretsen of Game Team One will review “Audio Invaders” by GameSalad developer, StormyStudios. Wow, very seldom am I really knocked off my socks with a concept that really feels original and that is exactly what Audio Invaders does. This game takes familiar mechanics like top down shooting in the vein of Space Invaders but removes your ability to see your attackers, causing you to rely on your ears to seek them out. That one change alone really makes the game feel wholly unique and really shows how much for granted we take audio input from games. The gameplay itself involves tilting the device left and right to shift your ship’s position in the fictional cityscape left and right. Your attackers are pretty much invisible (save for a sometimes noticeable silhouette) but they produce repeating chirpy sound effects that give away their location via positional sound. Meaning, the left and right speaker of your headset will mix the audio volume in a way that lets you know if the enemy is more to your left or more to your right. When the volume is equalized in the left and right speaker you know the enemy is directly above you and that is when you tap the device to shoot. It is wholly satisfying when you shoot up, unsure if your ears are fully tuned in, only to find you were right on the money and the enemy is revealed before taking a few more shots and exploding. As you progress you unlock additional weapons that all have their own look and feel. It keeps the game fresh and also makes clever use of basic block shapes. Visually, I think the game nails a very tricky style: neo-retro-noir. I don’t even know if that is an official genre but maybe I just coined a new one that this game falls into. 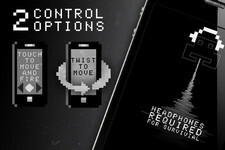 The whole game takes place in black and white – and from the moment you hit the title screen to the first time you navigate the environment you are taken back to an old school world of sci-fi movies with a little PONG for good measure. Then the game does some unexpected 3D effects that make the retro style all the more deliberate and impressive. It feels like all the basic blocks and shapes have been extruded and there is some real depth to the environment. The 3D effect on the buildings as you scroll by is subtle and elegant and one of the best uses of scaling tricks I have seen in some time from the GS community. 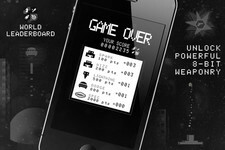 In short, the game is a terrific display of an original concept with some major style points. It was an unexpected treat for me and I hope others can appreciate the subtleties and execution.